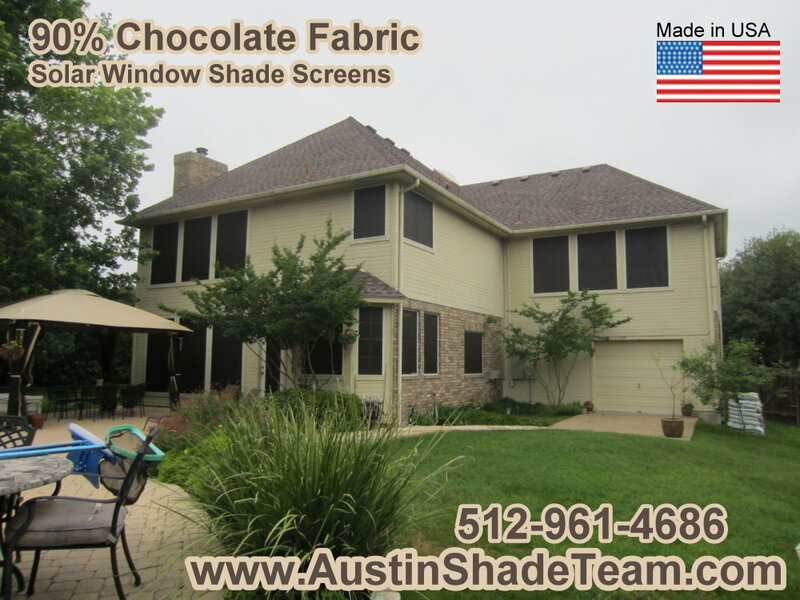 The Austin Shade Team are the shade experts serving Austin and the surrounding area, including our beloved clients and friends in Cedar Park. With over 10 years experience in the area, we know Cedar Park has a desperate need for relief from the unforgiving Texas sun. With our solar window screens and roller shades, you can reduce the amount of heat transfer entering your home through your windows, doors, and other openings, to provide maximum comfort while also reducing your energy costs from blasting your air conditioner all day. All of our solar screens and shades are manufactured by us and will be measured to fit any shape of window on your home, meaning you never have to sacrifice quality or function. Of course, we strive to provide the lowest price, which is why we are proud to service Cedar Park for no additional installation cost. But most importantly, you’ll be getting the Austin Shade Team and our unparalleled commitment to the best products and services possible. Solar window screens are perfect for cooling your Cedar Park home and protecting you from the sun’s heat and potentially harmful UV rays. Our solar window screens do this by covering every inch of your window and providing actual shade, not just a tint that will still emit heat. This here is a great picture showing what our 90% solar screens look like. 90% solar screens are solar screens that we recommend for the sides of the home or business that faces West. Or 80% solar screen fabric is sufficient for your Northern, Southern and Eastern exposed windows. The extra 10% that you get from this 90% solar screen fabric, is warranted for Windows that get 4 hours of direct sunlight and more. To take a look at more pictures of our solar screens, click here. 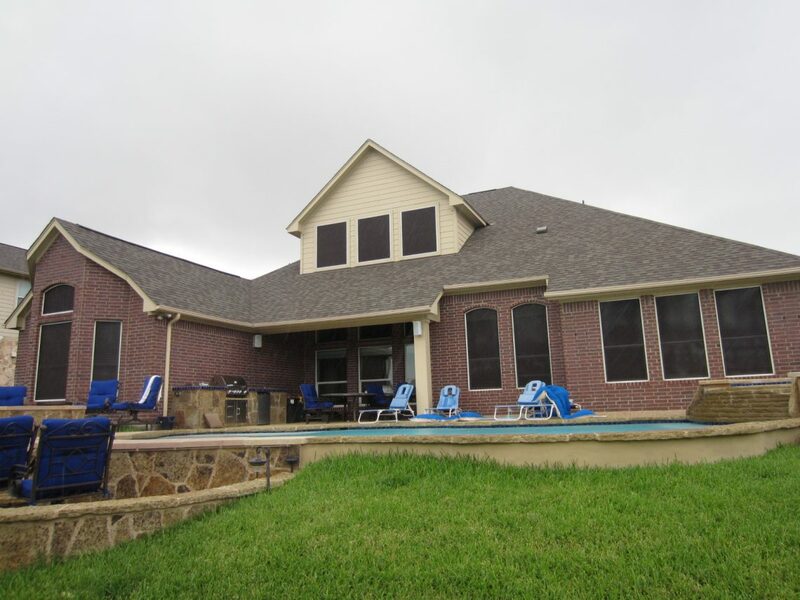 This customer put our 90% solar screens on every window for this back side of the home that faces Due West. The customer even chose to put a solar screen on the patio door, you will see there on the first floor behind (to the left of) that shrub, to the left of the bay windows. You’ll see that, that door has a solar screen on it. Those solar screens look a bit dark and drab. This picture, this particular shot, is not so great. I took this picture with an older camera and the picture quality isn’t so great. Additionally, and most importantly, is that there’s not any sun out at the moment when I took this picture. You’ll see over the home there at the sky, it’s all grey, there’s no sun out and I don’t see any blue for the sky. Additionally, you don’t see any Shadows on the ground. Thought: Shadows are always a good indicators to tell you how the Sun is going to hit your home. We can fit any size, shape, and style of window with our custom solar screens, with fabric in 80 percent or 90 percent density and a variety of colors to match your home’s paint scheme. For this picture below, you’re going to see that he’s got some windows that are arched, meaning they are not rectangular or Square, that all four sides are not straight. You’ve got an arch there to the far left of the picture, it’s over a 45 by 72 inch tall rectangular-shaped window, you’ll see a 45 by 30 inch tall arched window. The arch solar screen that we Built For This arched window, that sits on top of the window flawlessly, the measurements, the construction, the installation, it was all perfect, the solar screen follow all of the metal window edges for that window flawlessly, like do all of our arches. We are impeccable when it comes to odd shaped windows. There to the right of the patio are two full height arches, these two full height arches are very tall, 96 in in the middle tall, by 35 inches in width. Because we are Master Craftsman when it comes to solar screens, if you go inspect our arches, you will see that they flow, follow, the arched window framing of your window perfectly. With some 5,000 homes in the Austin Texas area that we have put solar screens on over the years, we have gotten very good at this. No solar screens for patio. Solar Screens for a Patio, Y/N? I am a huge fan of screening all your windows for consistency, however sometimes it doesn’t make sense to do so. On the front of your home I would say that you never want to leave a window uncovered. On the back of the home and the sides of the home we can get away with it. For the back of this home, he left the windows under the back patio to include those there at ground level and the ones above those, those non opening 45″ x 20″ Windows, and the back patio door. He left all of these uncovered by solar screens, while solar screening all of the rest of these back side windows, for the rest of the home. While I am usually not a fan of leaving solar screens off of Windows, in this case I’m 50-50 about it. It might have looked a little bit better to have had those screened, they’re under the patio, but I don’t know if the cost would have Justified that little bit of better looking. And, because these are recessed so much, I don’t suspect it’s a shade issue whatsoever. So I am okay, with leaving these windows uncovered. We’ll install solar screens on your home with a smile on our face, so that you can have a smile on yours. Learn more about our solar screens. Like our solar screens, our custom roller shades are great for providing comfort and relief by shading the sun’s rays. Perfect for your patio, door, or outdoor space, our roller shades are maneuverable via a stainless steel pull chain so you can move them up or down throughout the day. 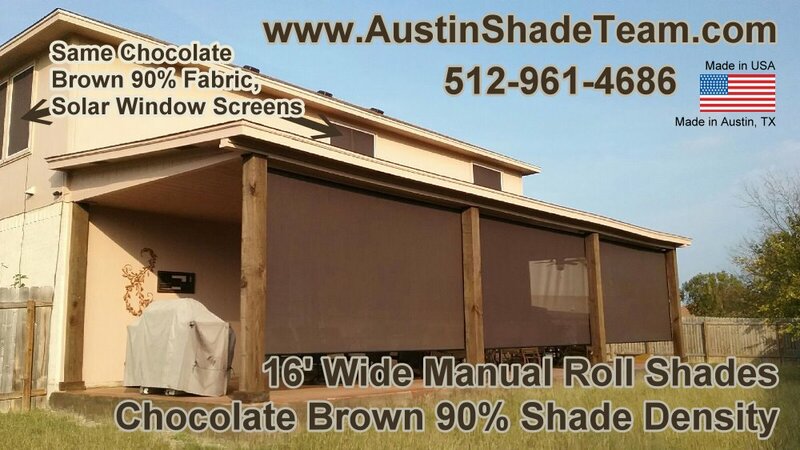 We are an Austin TX Roll Shade Manufacturer. Exterior roller shades, are roll up Shades that we make for patios and screened-in porches. They are designed to fit just as you see in this picture, towards the exterior of the patio. These kind of exterior roller shades are not made, or designed to go all the way down to the floor. Our standard drop for these roller shades is 82 inches. We do have available for those that need longer than 82 inches, the option to go to 99 inches, with limited parameters. For when we need to go longer than 82 in, they are for areas that have ceiling Heights that are more than 10 feet in the air. Roll Shades pictured here are 16 ft wide, we made them out of the same brown chocolate 90% shade screen fabric that we made this customer’s solar window screens out of. The roller Shades and the window screens are made from the same fabric. Because we manufacture these, we have this ability. To see more pictures of our exterior roller shades, please visit this section on our website. We’ll help you decide how long your roller shade should be, where it should be installed, and what density and color would be right for you.